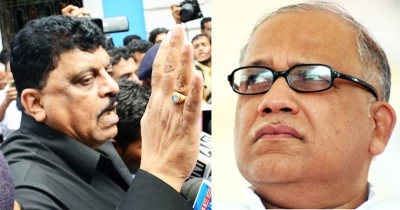 The central government’s Enforcement Directorate has moved into action, attaching properties of former Congress CM Digambar Kamat and former minister Churchill Alemao in the Louis Berger bribery case. The properties are worth Rs 1.95 crore. Presently, Digambar is re-elected as the Congress MLA from Margao and Churchill the Benaulim MLA of Nationalist Congress Party. Both of them have expressed ignorance over the property attachment news. But the ED press note issued in this regard has given all the necessary details. The major chunk of the property belongs to Margao Congress MLA Digambar Kamat, worth Rs 1.20 crore. It includes a plot of 4047 sq feet of land at Gogol in Madgao, a residential building in Taleigao and his fixed deposits of Rs 41.35 lakh. Comparatively, the property of Churchill Alemao is worth only 75 lakh rupees - eight apartments at Fatrade in his Varca village. The ED has also stated that the action is initiated after examining officials of eight firms, concerned government officials as well as hawala operators. These firms include Louis Berger of USA, Nihon Suido Consultants Co Lt of Japan, NGS Consultants Co Ltd of Japan and Shah Technical Consultancy Co Ltd of India. The ED also stated that a Letter of Rogatory has been sent to the USA for further investigation of absconding accused James McClung, who is presently imprisoned in USA. All honest Goans must come forward in large numbers and protest for re-election with ballot papers and show to the world that Goans are not Corrupt to vote BJP & Congress. EC must listen to the request of the Goans and start counting VVPAT immediately. All honest Goans must come forward in large numbers and protest for re-election with ballot papers and show to the world that Goans are not Corrupt to vote BJP & Congress. EVM manipulation has been taken place and this can be confirmed by counting VVPAT. EC must listen to the request of the Goans and start counting VVPAT immediately. When these guys are going to be arrested and arraigned in the court of law?